Competitive sport is all about pushing yourself to find your maximum, both in racing and training. Often, the first step in any new coach­-athlete relationship is determining fitness potential. This requires a benchmark, or scale on which to place the athlete. Since the late 1960’s, VO2max has been one of the primary methods to measure fitness potential. Since its conception, it has been used more and more widely as a training tool, even though there is conflicting evidence as to whether it actually increases with fitness. Summarized here is what VO2max is, how it can be measured, and how it can be used in training. VO2max is a measurement of how much oxygen you can consume in one minute. Fitness is a combination of muscular and aerobic strength, and finding out how much oxygen you can take in during a minute gives your coach a great idea of the potential for performance. The biggest factors affecting VO2max are age, gender, and baseline fitness1. It’s only half of the equation for fitness though- the other half being efficiency. This means that two athletes with the same VO2max can have markedly differing performances based on how they use the oxygen they have available. A runner with a perfect stride will run faster than his or her competitor with biomechanical inefficiencies, even with the same VO2max. A competitor weighing 55kg with the same VO2max as a someone weighing 65kg will likely run much faster for a given distance using the same amount of oxygen. The use of VO2max as a training tool has been debated almost since it was first invented. Its widespread use started when Kenneth Cooper designed a 12 minute test to find the fitness potential of Air Force cadets. The benefit was that a coach or researcher could perform the test on a large number of people at the same time, creating an efficient measure for the military. 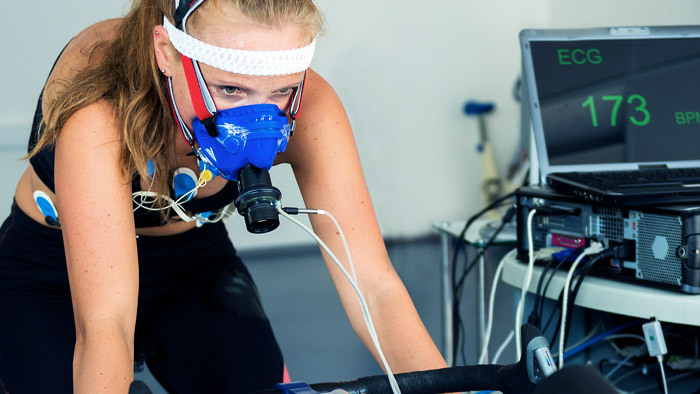 The results were originally used by Dr. Cooper as a one­-off test of a new recruit’s fitness, but now it’s very common for athletes to perform a VO2max test at different times throughout the year to measure progress. This is where the controversy starts. The biggest factors affecting your VO2max are already set in stone. Your age and genetics account for at least 50 percent of your number2, leaving only a very small change accountable to fitness. On top of that, some athletes respond to training very well, whilst others will see very little difference in VO2max after training3. Variation between testing days must also be eliminated to ensure that any change seen between testing days is actually a result of a change in fitness, rather than simply a new set of conditions. Altitude, temperature, clothing and shoes worn must all be standardized if we are to find the small increases or decreases in VO2max caused by current fitness level. Obviously, a lab test is going to produce more accurate results than a field based measure such as the Cooper test. VO2?max = (35.97 x d?12?) ­- 11.29 where d12 is the number of miles run in 12 minutes. Even in athletes whose VO2max does not alter after training, fitness and performance gains are still often noticed. So what is responsible for this increase in fitness if VO2max itself isn’t changing? For most people, improvements in running stride, muscle recruitment, weight loss, and accumulation of experience in a racing situation can account for increases in performance. So is it pointless chasing an increase in VO2max? Definitely not. Aerobic training will increase muscular efficiency, even if the amount of oxygen you use remains the same. For the athlete wishing to improve their aerobic capacity, training at between 85­ to 95 percent of your threshold has been shown to have great effects in producing performance gains4. For the runner, a 5k race is often said to be at or close to VO2max. Running at this pace in training may increase aerobic fitness gains. In reality, VO2max is a measure of fitness potential rather than fitness itself. This means that knowing your VO2max is a useful place to start any training plan. Don’t be discouraged if your number hasn’t increased 12 months later though, use other measures like PR’s over a particular distance as a measure of performance gains. VO2max is a useful metric, but it is only one number in a whole world of fitness data.